Jackson, who is currently promoting his latest album “For You” (Orpheus/EOne Music), hits include “Jam Tonight,” “Do Me Again,” “You Are My Lady” and “Rock Me Tonight,” which went platinum. Hewitt, formerly of the group Shalamar, hits include “Second Time Around,” “A Night To Remember,” “Dancing In The Sheets,” and “This Is For The Lover In You” – with the group and “Stay” and “Say Amen” as a soloist. “Say Amen” became his signature song. Osborne hits include ‘Back In Love Again” and “Concentrate On You,” with his former band L.T.D., and “On The Wings Of Love,” and “Stay With Me Tonight,” as a soloist. Jeffrey Osborn also wrote the lyrics to Whitney Houston’s “All At Once.” Bryson’s hits include “Feel The Fire,” “Reaching For The Sky,” “I’m So Into You,” “If Ever You’re In My Arms Again” and “Can You Stop The Rain.” He won two Grammy Awards, one for “Beauty And The Beast,” featuring Celine Dion and “A Whole New World,” featuring Regina Belle. Jackson said that the tour has already been asked to come to Europe and Africa. The “Men of Soul” Tour will arrive next June 24, 2011 at The Nokia Theater Los Angeles and June 26th in Monterey, California. On May 8th Freddie Jackson performs in Washington, DC to honor Grammy Award winning producer/songwriter Barry Eastmond (Anita Baker) at the Library of Congress. “We all get together at the end and come on stage and connect,” he informed me. Freddie said the overwhelming response to the tour is because adults want to go out and hear good music, hold hands, etc… I agree, it seems a lot of the R&B groups, bands and artists with hits from 10-20 years ago are experiencing an emergence of popularity that is very refreshing to me. I see it changing the scope of modern music into something we all have not heard before. I personally can not wait to hear the balance in the old school and new school sounds. 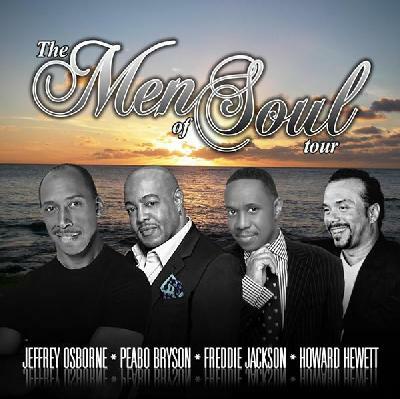 For more information on the “Men of Soul” Tour featuring Freddie Jackson, Howard Hewitt, Jeffrey Osborne and Peabo Bryson log onto www.MenofSoulTour.com. *Don McGlynn’s emotionally inspiring documentary on the history of Gospel music is a Magnolia Pictures release, produced by Deep Rivers Production and executive produced by Mark Cuban and Todd Wagner. It features commentary by Andrae Crouch, Mavis Staples, Ira Tucker and Ira Tucker, Jr., Marie Knight, Bill Carpenter, Willa Ward and Smokey Robinson. The documentary had me rejoicing, shouting and crying – especially when they covered the incredible career of Mahalia Jackson, considered the greatest Gospel singer in the world. 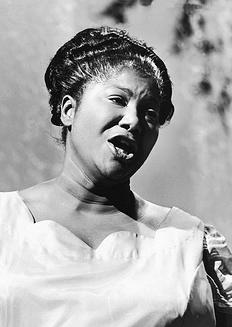 “Mahalia Jackson crossed all barriers,” Smokie Robinson said of the Gospel legend. “Mahalia sold 2 million records in 1947 at a time when 200,000 was considered a success,” said Gospel historian Bill Carpenter. Smokie spoke on today’s Gospel music, explaining that in today’s time Gospel music is different from the past, but it is still Gospel music. The documentary takes you to the beginning during slavery in the cotton fields where Spirituals began. Then it progresses to the church and its acceptance of the different genres of Gospel music. “If we go back to 1900s…Black Baptist developed a polish sophisticated style of worship,” Carpenter said. Rejoice and Shout will explain how Gospel music went from conservative to what it is today. The documentary film will open in New York on June 10, 2011 and then Los Angeles – along with the top ten markets – on June 17th. The documentary covers 200 years of music history of African-American Gospel. For more information on Rejoice and Shout log onto www.MagPictures.com. I love everyone but, Freddy Jackson. I just can’t stand his voice and he just doesn’t come across masculine enough for me. If he came on last, I’d just leave because I can’t sit through one of his sets. freddie looks slitely ill.. i think his voice is weeken by whatever seem to ail him..but i do wish him well.. howart huwett acts kockie he disturbs me poor freddie they probably talk about himm in the dressin rooms..but peabo and jeffery..yes baby love them…lv them all really tho! Now this is what’s up!! Real singers, sangin’ for real! !